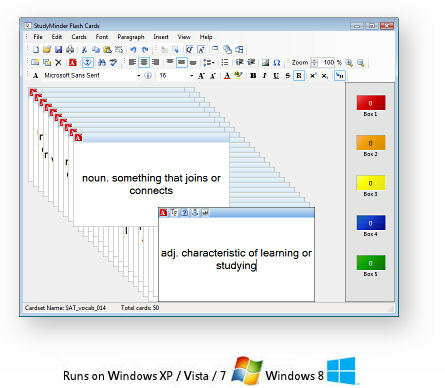 The StudyMinder Flash Cards main edit window. StudyMinder Flash Cards is the perfect study tool for students to quickly create flash cards to memorize or review practically anything. It’s ideal for any subject. Traditional flash cards are an effective way to learn, but time consuming to make. StudyMinder Flash Cards changes all that. It’s easy to get started. Working with StudyMinder Flash Cards is just like using a word processor. 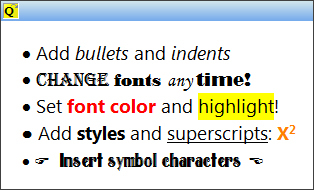 Highlight the text you want to change and then select a font, or click one of the style buttons. Your cards appear exactly as they will when printed. StudyMinder Flash Cards supports the international Unicode character format, so you can add characters from all foreign languages. 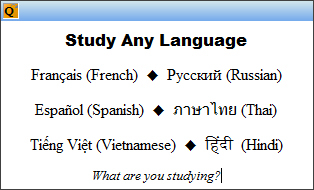 It’s perfect for studying Spanish, French, German, Italian, and other popular languages. Or how about Armenian, Cambodian, Korean and Chinese? They are supported, too. Install additional spell check dictionaries. Over 100 free foreign language dictionaries that work with StudyMinder Flash Cards are available for download at no charge from OpenOffice.org. Sample flash card created with StudyMinder Flash Cards. Sometimes a picture is just better – or a diagram, chart or photograph. With StudyMinder Flash Cards you can easily add images from any source – your own photos or any that you can find on the web. Once inserted into a flash card, you can add your own text above and below the image. 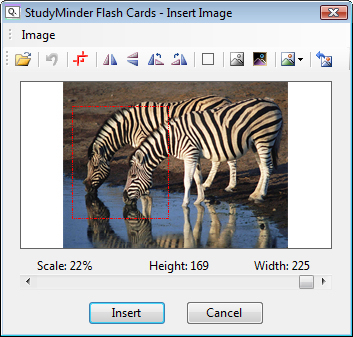 StudyMinder Flash Cards lets you print your finished flash cards on any printer. Don’t have any index cards? No problem. You can print your flash cards - 8 per page - on standard 8.5” x 11” paper and cut out the cards. If you do have index cards on hand, they work too. Both 3x5 and 4x6 card sizes are supported. If you’d rather not print out your flash cards to study them, it’s not required. You can easily manipulate your flash cards on screen, as if you were holding them in your hands. Even better, your electronic flash cards won’t get bent, folded or lost. Here’s how it works. Next to the flash cards edit window are five colored boxes, numbered 1 through 5. The number on each box lets you know how many cards it holds. All new cards you make start in Box 1. Click through each of your cards and quiz yourself, just as you would if you were holding a set of printed flash card. Pick a card, guess at the answer and then flip it over. If you are correct, drag the card into Box 2. If wrong, the card goes back into Box 1. When you are finished, the more difficult cards will be in Box 1, and the easier ones in Box 2. Now go through the cards in each box again. When cards in Box 2 are answered correctly, move them to Box 3. If you answer incorrectly, drag that card back into Box 1 and start over again. Continue at your own pace until you have moved all the flash cards into Box 5. The Leitner Method ensures that you review difficult cards more frequently than easier ones. This is the fastest way to learn all of them with the least amount of study. When all the cards are in Box 5, you should know them quite well. StudyMinder Flash Cards has many features designed specifically for taking advantage of the Leitner Method of flash card study. Each card has an icon at the top left that shows you the side you are looking at: “A” for the Answer side or “Q” for Question side. Click the icon to flip the card. The color of the icon matches the color of the box that card is currently stored in. When you save your card set to a file, the locations of each card are also saved, so you can come back and continue your studies right where you left off. StudyMinder Flash Cards has additional features to help you review your cards and make studying more fun. When you select the “Show Study Buttons” you can do more than just guess at the answers. Click the True/False button to flip the card over. The answer shown may be correct, or it may be the answer from a different card. Press the “T” or “F” key to indicate your answer. The program will tell you if answered correctly. 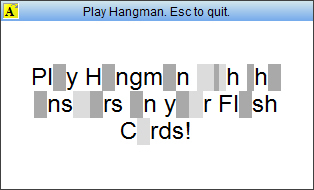 Click the Hangman button to play a game of hangman. The letters in the answer are revealed as you type them in. Or, you can click the Exact Answer button, and then type in the answer exactly. This test feature is ideal for studying spelling and vocabulary words. You can also click the Peek icon. The card will flip over with the answer hidden. Press any key to reveal one letter a time. Letters are uncovered in random order. Clicking the Esc key when you think you know the answer will display all the letters. The Peek feature is especially useful for studying foreign language words and phrases, since entering these characters from the keyboard may require multiple keystrokes. A game of Hangman in progress. Sample card created with StudyMinder Flash Cards. Flash Cards are a proven learning tool that will boost your confidence - and your grades. Download StudyMinder Flash Cards now and try it out. It’s free to use for 30 days. Your purchase includes 5 registration keys that you can use now and in the future when you upgrade to a new computer. You can also share your keys with family and friends. Limited Time Offer: Right now, StudyMinder Flash Cards is Free with the purchase of StudyMinder Homework System. "This is the best study aid I have ever used. I just love that you can choose the type of testing mode that you like best. After trying 3 of them I know the information I was trying to learn and I am off to learn something else. It’s really a great program and a great value for your money." "Keep up the good work. For people who love flash card study and computers, your program is a God-send." "I love the Flash Cards. They are a great study tool, as traditional flash cards always have been, but they are easy to edit and save and transport making them an asset to my studies."